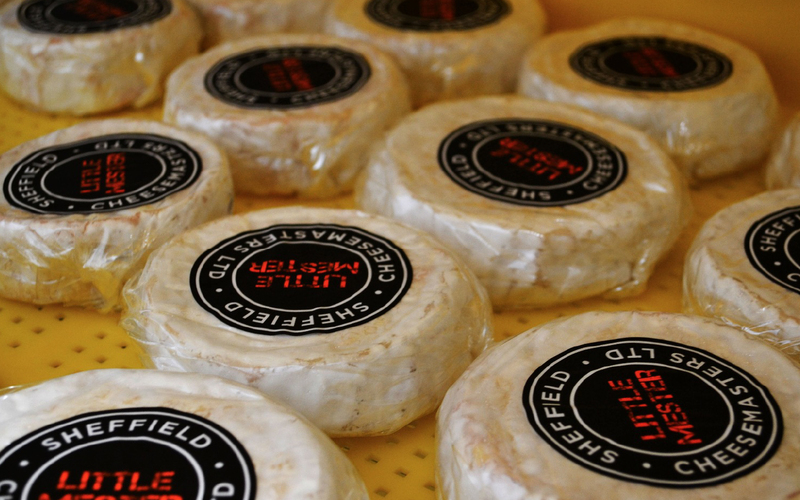 She has only been producing since October, but her first made in Sheffield cheese is already wedging well into the local community of independent manufacturers. Meet Sophie Williamson, who left the daily grind to cultivate handmade cheesemaking. Soon after leaving Our Cow Molly, we drive down the Sheffield hills to the urban Kelham Island, where the positively evolving collaborations between local producers can be witnessed… and tasted. “Our Cow Molly were hugely supportive from the beginning,” says Sophie, who swears by their fresh milk in her cheesemaking process. Seeing how comfortable Sophie looks in her spacious Kelham Arcade unit with a fully glazed makeroom in its centre, you would never think she was a cheese newbie, let alone guessed her previous profession. “I worked in cybersecurity for many years, before I was given a ticket for a cheesemaking class one Christmas,” she explains. The love for cheese struck Sophie like a lightning, and soon after, in February last year, she was handing in her notice. “My colleagues thought I was totally mad,” she laughs. As local cheese lovers, we can only thank her for not taking it to heart. 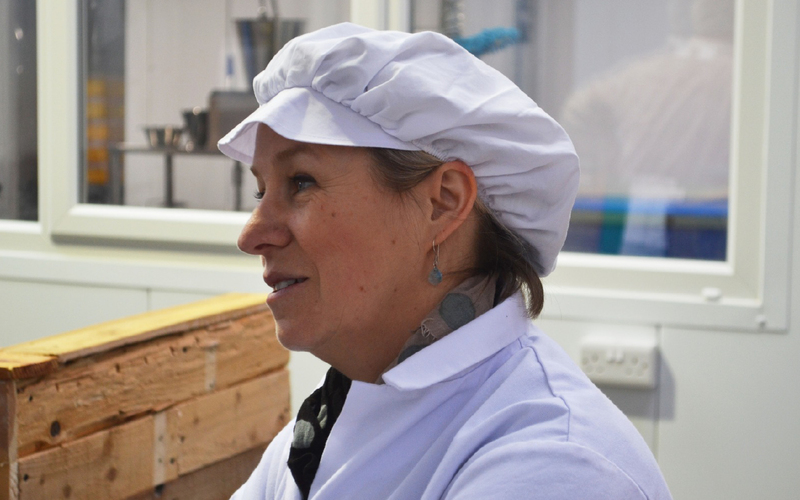 Following her rapid career change, Sophie participated in more professional courses and learned from other members of the UK’s Specialist Cheesemakers Association, while deciding on the style of cheese she wanted to make. “I personally like to eat camembert and epoisse style cheese, which is what I set up to produce eventually,” says Sophie, showing us the different stages of making her first baby, the Little Mester. 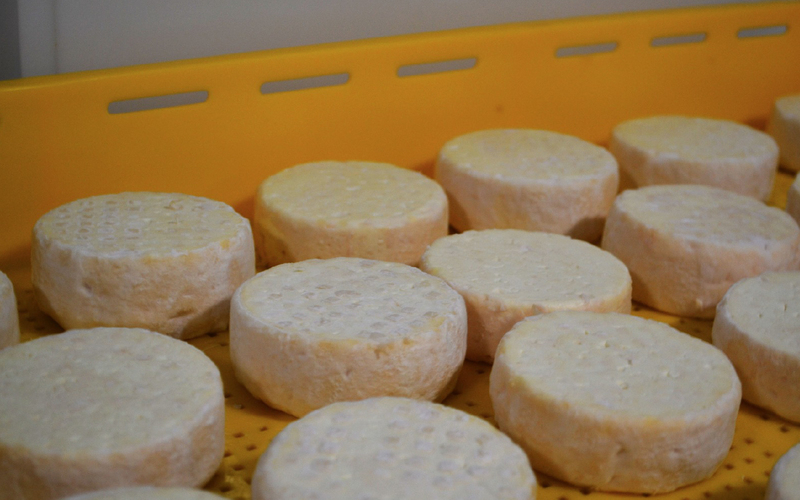 “It’s a soft, surface-ripened and also a fast maturing cheese, it only takes 2,5 weeks from start to finish. I didn’t want to wait a whole year to be able to sell it,” she laughs. 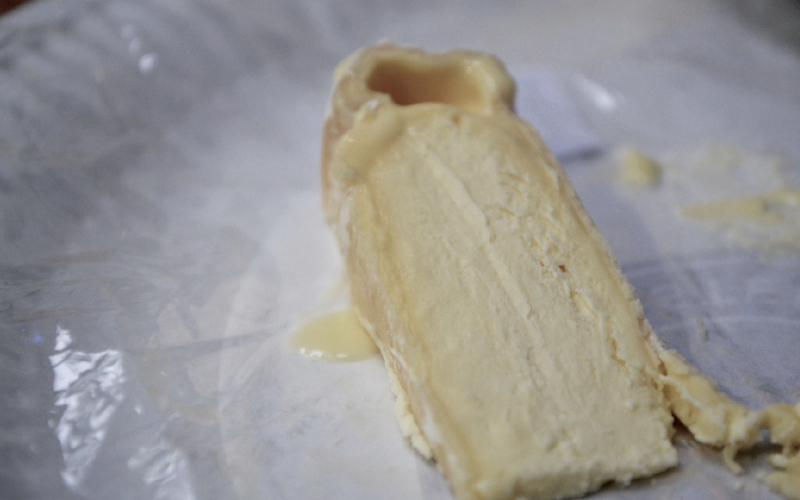 Sophie also uses a non-animal rennet alternative to curd her cheese, making her artisan product suitable for vegetarians. “I wanted to be more accessible,” she adds. We’re then lucky enough to try Little Mester at its birthplace. It’s got a thin skin and is deliciously creamy to taste, with a firmer texture in the middle and a touch of gooeyness on the edges – perfect for cheeseboards, which both Butcher & Catch, as well as Sophie’s first customer Rafters, have on their menus. “It’s fantastic to be listed among all of those fantastic cheeses I am in awe of,” admits Sophie, who now makes around 270 cheeses a week and supplies many delis and shops, such as Beanies, Urban Pantry and her next-door neighbours, Depot Bakery. 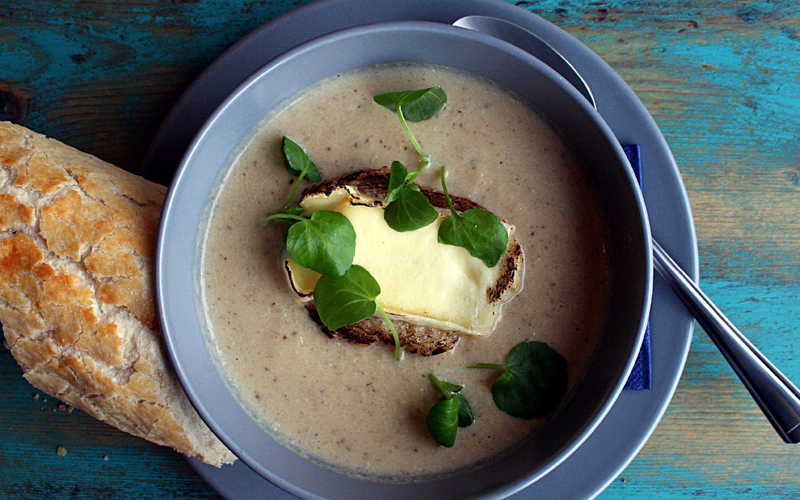 Other than tasting great on crackers, Little Mester also melts beautifully, making an appearance on our menu as a topping for the unconventional Cheese and Poached Pear Oysters, or the creamy Celeriac and Ale Soup. Word is on the street, soon you may even expect it served in larger quantities – whole, baked and brilliant for dippage. As an urban cheesemaker, Sophie is also happy to get customers on board – not just during the monthly Peddler Market, but also at Cheese and Wine evenings and workshops, where participants can have a go at stretching their own mozzarella. “Initially, I was going to make my cheese at the Our Cow Molly farm, but I’m an urban person and preferred to brand it that way,” says Sophie, who often gets passers-by peaking through her windows to witness some cheesemaking magic. “I enjoy being a part of this independent craftsmen community,” she adds, and seeing how popular Little Mester is becoming, we can now only wait to see who will be joining him. 1. Pour the wine and 300ml water into a pan. Add all the other ingredients, apart from the pears, put over a low heat, then stir until the sugar has dissolved. Bring to a boil, then simmer for 5 minutes. Remove from the heat and leave to infuse for 15 minutes. 2. Return the pan to the heat and add the pears. Bring to a gentle simmer and submerge the pears in the liquid for 35-40 minutes, turning occasionally, until just cooked and ruby red. Remove from the pan to a bowl and set aside to cool. 3. Bring the poaching liquid back to the boil and reduce by half (to about 500ml) until slightly syrupy. Cool a little before pouring over the pears. Cool completely. 4. Put the cheese on top of an oyster and blowtorch until the cheese begins to melt slightly. 5. Add the diced poached pear and blowtorch again to caramelise. Serve with lemon, on a bed of sea salt.